Looking for fun, free and cheap activities your kids will enjoy doing this summer? While there are many fun things to do around the Tampa area, bowling can be a great way to keep your kids active and entertained. Register your kids for free summer bowling or even a summer game pass at AMF bowling for one low price. Kids love to bowl, and parents love free and cheap bowling! Spend the summer at one of your local Tampa Bay Area bowling lanes with these free and cheap deals. Kids can bowl FREE all summer long at the participating Tampa Bay Area bowling lanes. Parents can sign up their kids ages 15 and under to bowl 2 free games daily during the entire summer. When parents sign up, emails are sent with your coupons every Sunday for as long as the program runs. 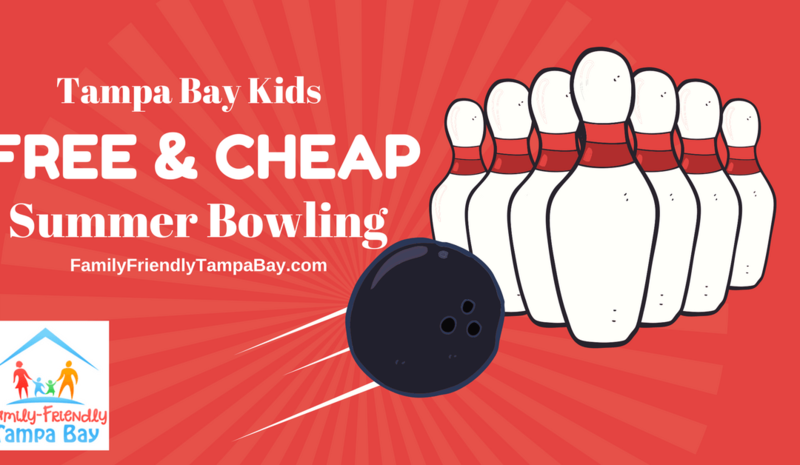 Check out the Tampa Bay bowling lanes below to register your child for their FREE coupons. *Family passes may be available at a discounted rate so parents/guardians can bowl as well. Contact the location for more information. Register at Countryside Lanes for a free bowling pass. Register at Dunedin Lanes for a free bowling pass. Register at Liberty Lanes for a free bowling pass. Register at Lane-Glo Bowl for a free bowling pass. Register at Sarasota Lanes for a free bowling pass. Register at Seminole Lanes for a free bowling pass. Register at Sunrise Lanes for a free bowling pass. Register at Ten Pin Lanes for a free bowling pass. Register at Cypress Lanes for a free bowling pass. This summer the AMF Lanes is offering a great deal for kids and families. Kids 15 and under can register for an AMF Kids pass that includes 3 games of bowling each day this summer from May 21st until September 3rd, 2018. Bowl all summer long for one unbeatable price and shoe rental is included in the price! Passes are on sale now and they have some special deals if you purchase by May 4, 2018. 1. 15 games of bowling for just $14! 2. Reload to keep the fun going! $10 gets you 10 more games. 1. For students in grades K-12. 2. Buy yours beginning today and sale ends on September 3, 2018, but your games never expire. 3. Pick up and pay for your card in any of our their three locations in Tampa and Zephyrhills.